Tiger Woods is embarking on his latest comeback without a swing coach. Woods said Friday on Twitter that since fusion surgery on his lower back in April, he has been relearning his body and his golf swing by relying on feel and the previous three years of work with Dallas-based Chris Como. "For now, I think it's best for me to continue to do this on my own," Woods said. "I'm grateful to Chris Como for his past work, and I have nothing but respect for him." A round of 72 is typically nothing to get excited about for Tiger Woods. But considering he's rarely had a scorecard in his hand to record anything of significance over the past two and a half years, even he would deem his opening-round effort Thursday at the Farmers Insurance Open a success. Playing his first official tournament in a year and making just his fifth worldwide start in the past 14 months, Woods made three birdies and three bogeys on the South course at Torrey Pines -- eight shots behind leader Tony Finau but in position to make the 36-hole cut. Tiger Woods made the cut this week. Are Nike and Tiger rewriting the dress codes for most country clubs that require collared shirts? Congrats to Jason Day on the thrilling 6-hole overtime victory, well done! Always fun to watch the beautiful pro-am from Pebble Beach! A continual combination of missed fairways, missed greens and missed putts added up to a missed cut for Tiger Woods at the Genesis Open on Friday. Playing just his third event since a fourth back surgery last year, Woods struggled to find any rhythm and maintain any momentum on a Riviera Country Club track that has often befuddled him. Following an opening-round 1-over 72, Woods carded eight bogeys during a second-round 76 that left him four strokes off the projected cut line. Now in his 10th year as a pro, Patton Kizzire has seen a few things. He has dealt with the pressure of winning in golf's minor leagues, qualifying for the PGA Tour and winning his first two tournaments. Tiger Woods will always be linked to Jack Nicklaus, for better and worse. And while his performance at the Honda Classic will undoubtedly be viewed as a positive step in his comeback, he can point to the Golden Bear as the reason perhaps it was not better. Woods shot a final-round 70 at PGA National on Sunday to tie for 12th in just his third tournament this year following spinal fusion surgery in April. Tiger Woods will play the Valspar Championship for the first time, announcing via Twitter on Friday morning that he has added the Palm Harbor, Florida, tournament to his schedule. He also said he will play the following week at the Arnold Palmer Invitational. Phil Mickelson knew this was coming, even when he had so little to show for it. Mickelson had played 101 tournaments around the world since he last won at Muirfield in 2013 in The Open, which moved him to No. 2 in the world and gave him the third leg of the career Grand Slam. In more than two decades on the PGA Tour, he had gone only two seasons without winning. Half way thru and Tiger is in the hunt! stark wrote: Half way thru and Tiger is in the hunt! Now he's tied for the lead. Leader Corey Conners caught a break imho when he was paired with Justin Rose on Sunday rather than Tiger. But I'm guessing Tiger gets the better nights sleep Saturday night. Haven't seen any TV ratings yet but I'm guessing those numbers are good and the rest of the year is going to be fun to watch, buckle your seatbelts and enjoy the ride. Well, that was an interesting weekend of golf, no? 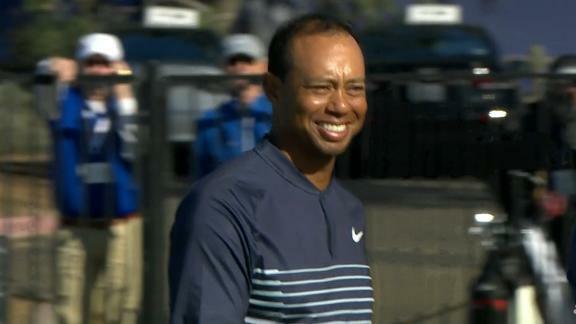 Tiger Woods came up one putt short of forcing a playoff against eventual winner Paul Casey at the Valspar Championship, the closest Tiger has come to winning a tournament in nearly five years. Tiger Woods climbed to the top of two boards Thursday morning. Woods birdied three of his first nine holes to take an early lead at the Arnold Palmer Invitational in Orlando, Florida, before double-bogeying his 12th hole to fall back. Henrik Stenson did just enough right and was happy enough to take a one-shot lead in the Arnold Palmer Invitational, even if he wishes it could have been more.